Discover the advantages of installing aluminum fencing in your home. Are you looking for a fence to provide you with security and peace of mind throughout the whole day? Aluminum fencing is the perfect option to keep your home or property safe while seamlessly blending in with your other landscape features. Pick a fencing material that your whole benefit from and you will have for years until you choose to sell. Discover the never ending benefits of aluminum fencing today! One of the most sought after features of aluminum is the protection it provides your home from theft and other crimes. It is the perfect addition to install around your pool to keep out any unwanted guests from taking a midnight swim. 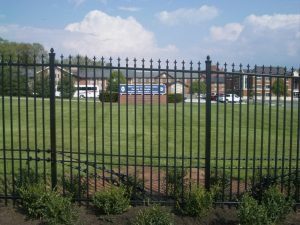 Aluminum fencing is an effective way to display where your property lies and is a great option for apartment complexes. Overall, aluminum fencing will make your whole family feel safe and lets them sleep soundly at night. If you are looking for fencing that will withstand all of the elements from rain storms to snow, then you should look into aluminum fencing. It is the smart option if you live an area that is prone to high winds. Aluminum fencing stand up well to everyday wear and tear and is even rust proof! So you will never have to spend time or money repairing your fence, and you can look after other features around your home. When looking at fencing, you need to think about the instant benefits as well as the how it will benefit you in the long run. Aluminum fencing is a feature that is extremely desirable to prospective home buyers so that it will add value to your property. When you eventually put your home on the market, make sure to make your aluminum fencing a selling point. It will allow you to sell your home quickly and even for more money than you thought! This entry was posted on Friday, September 8th, 2017 at 8:24 pm. Both comments and pings are currently closed.